If I told you that Final Fantasy XI, an MMORPG that is now about fifteen years old, is still receiving major content updates, how would you react? Well you better figure it out soon because Final Fantasy XI’s November content update has officially dropped! The biggest piece of content in this patch is the new Dynamis-Divergence battle event. To participate in this event, players will need to have to completed the previous event Dynamis-Tavnazia first, where they’ll earn a Diabolos-related key item. Players will also need to have completed the final chapter of Rhapsodies of Vana’diel. 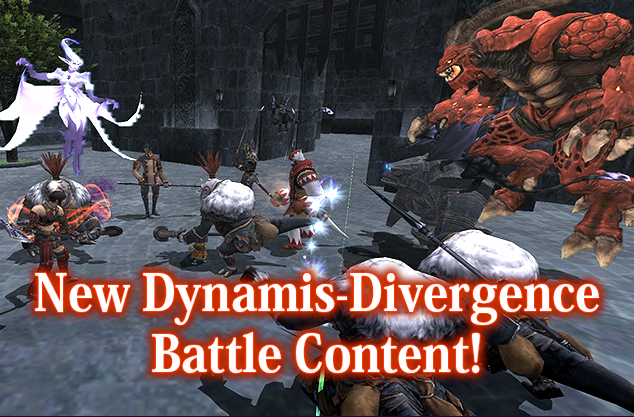 After meeting the prerequisites, players can then challenge the challenging foes in the Dynamis-Divergence. To celebrate the release of this patch, the game will also be hosting a “Return Home to Vana’diel Campaign”. If you’ve previously had an active PlayOnline account that is now disabled, you’ll be able to log in and play with your old characters from November 10 to November 24 for free! To you help you get started after a long time away, there’s a set of systems to boost your progress, including a mechanic that automatically increases your item level, a week of complimentary items. If you’ve never taken a step into the world of Vana’diel, the Final Fantasy XI Ultimate Collection Seekers Edition, which as you can probably guess from the grandiose name contains the game and all of its expansion packs, will be 67% off on the Square Enix store at $9.99 USD. Although if you’ve never played the game before, it might be a little hard to do so in today. The game has definitely aged a lot, but if you’re looking for a unique and interesting experience that modern MMOs don’t really offer anymore, we highly recommend checking it out for just a little bit. Who knows – you might end up loving the game!